'Tis the season for carbs and cream, aka Comfort Food. Chicken and Dumplings is one of those meals I never really had as a kid - we reverted to mac and cheese and lasagna for the (few) nights cool enough to enjoy such things (in S. Fla, the temperature, even in winter, rarely drops below 50). So veggie-fying them now, and taking them to gluten-free land is pretty amusing to me. I imagine, like most loving cooks, my recipe will evolve gradually until it perfects itself, and I'll make it that way for the rest of the rest. Since this is the first permutation, tho, there's room for exploration. 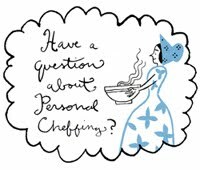 And if you have a recipe or tip you'd like to share, I'd love to hear it. The one problem I imagined going into this for my GF clients was the weight of the dumplings. GF flours tend toward the beany, weighty side - and even with the addition of egg, I didn't have confidence in them to "cloud up" appropriately. In fact, the first version I made had that very issue, so for version 2, I took a couple extra steps, and they turned out much lighter. ALMOST fluffy. Yum. dumplings adapted from this recipe, thanks HTTG! Heat the buttermilk in a small saucepan and add the butter. Beat the eggs until frothy and add to the milk mixture. In a medium bowl, mix your dry ingredients and herbs thoroughly. As you stir with a SPOON, slowly add your wet mixture to the dry and mix until just incorporated. The more you mix, the tougher the dumplings. The dough will be very sticky. You can spoon dolops of dough into your stew when ready or, if you want more uniform shapes, shape them with wet hands and drop them in one at a time. Simmer the tofu in your broth for a few minutes then strain, keeping broth. Heat about an inch of oil in a skillet and shallow-fry until golden on all sides. Drain on paper towels. Melt the butter in a small dutch oven. Add celery, carrot, and garlic and saute until celery is translucent and carrots have lost some crunch. Add broth, herbs, pepper, peas, cream, and tofu, and check for salt. Add if necessary. Bring stew to a simmer and add your dumplings, spacing them out to "cover" the stew. Cover the pot and simmer for 10-12 minutes, until the dumplings are super-puffy and done in the middle (check with a knife or bamboo skewer, it'll come out dry). This recipe makes for a thinner stew than some care for. I use corn starch as rarely as I possibly can, so I didn't add any to thicken. Super-tasty and nutritious, this. Enjoy!